This month C&IT is looking for your opinions on trade shows and whether they provide return on investment in the current economic climate. In C&IT’s May issue, Jenny Hullock, venue manager at 76 Portland Place, argues that trade shows are not worth the money and there is no guaranteed return. As Imex prepares to open its doors in Frankfurt for its tenth anniversary show this week, C&IT wants to know if you agree with Hullock’s point of view? 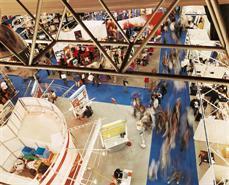 Are trade shows too expensive for exhibitors? Is the cost prohibitive for smaller businesses/venues? Do you find that the quality of buyers is not good enough? Have you cut your budget for trade shows? What could trade shows do to improve? For visitors – are trade shows worth the time out of the office? Please join the debate on Twitter using #citbigdebate or email Susie.harwood@haymarket.com with your opinions? Our article will feature in the June issue of C&IT magazine.